Listings on this site really do work and will generate a significant number of hits for your website and consequently more sales. This site has been specifically designed to help you and your business. It has a wealth of information about the town and attracts large numbers of web visitors. 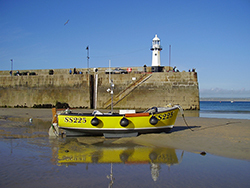 Many St Ives busineses are listed here. Most of them took out an initial 6 month listing and have then renewed continually ever since. I promise to as much as I can to help you get the most out of advertising here and to promote your business as effectively as possible. Listings for businesses start at £60.00 for six months or £100.00 for 12 months. Listings in the Self Catering section start at £85.00 for six months or £160.00 for 12 months. This is for a standard listing on an appropriate page, such as the one below. You get around three paragraphs of copy, up to two pictures and a link to your website. You can also have links to your Facebook and Twitter pages. Premium listings are also available - contact me for details. Banner ads like the one below for Oates Travel. Featured site listings on the Home Page of the site. "Last Minute" offers - particularly useful for self catering properties and hotels. Competitions - you provide a prize and get some free exposure in return. Anything else within reason - I am always open to suggestions. The cost depends on where you would like the ad placed and how long for. Get in touch to discuss your requirements - I'm happy to help you to get the best value that you can. Oates Travel - Coach trips and tours from St Ives to The Minack Theatre , Truro and places around Cornwall. Get in touch if you are interested in these options.